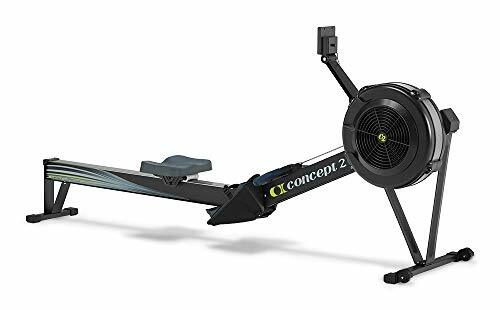 Concept2, a leading fitness equipment company with 30 years of experience in designing and manufacturing indoor rowers and racing oars, has developed the Concept2 Model D Indoor Rowing machine. This stationary exercise equipment simulates the thrill of real life rowing while providing multiple health benefits. It features a calibrated flywheel design and is collapsible for easy storage. It comes equipped with a spiral damper to control the rowing intensity and is available in both gray and light blue. This machine is truly a must for anyone trying to stay in shape or trying to improve their rowing skills. This rower is well constructed using all of Concept2’s expertise. The frame’s seat tracks are made from high-quality stainless steel with aluminum I-beam monorails. Made from non-corrosive components, this equipment guarantees durability. It also features a sliding seat and smooth track for flexible hand and leg movements and flexible footrests to accommodate people of all shapes and sizes. 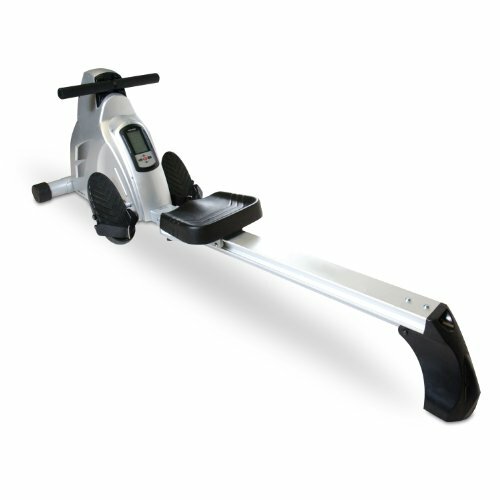 This rower is equipped with a self-calibrating PM3 performance monitor with a user-friendly interface. It includes display options such as force curve, bar chart, large prints, etc, to help you keep track of the number of miles covered, speed and pace maintained during workouts as well as calories burnt. It can store data from up to 300 workout sessions and allows the user to make comparisons with previous sessions. It also gives options to customize your workout sessions. This machine gives you access to tons of games, programs, and animations that teach proper rowing techniques to novices. It also has an online function that allows you to compete with other rowers which can really help stay motivated. When upgraded to PM4, added features such as wireless heart-rate monitoring, wired or wireless racing become available with a rechargeable battery pack. The spinning flywheel design featured on this rower works with air-resistance, providing a nice and smooth rowing experience. It eliminates the need for brake pads and the mechanism produces minimal friction. This feature makes the Concept2 Model D rower an incredibly quiet piece of machinery. The spiral damper controls pulling intensity during your workouts and makes it possible to enjoy the sleek movements of a fast boat or the slow movements of a heavy boat to your preference. Uniquely designed to be separated into two parts, this machine is easy to assemble and collapse. This can be done by simply following the detailed instruction provided in the manual, without the aid of any tools. This makes this unit very easy to carry and store. The Concept2 Model D is a gym quality rowing machine that can effectively tone the body and provide a full body, high-intensity workout. It is a perfect option for people of all shapes and sizes trying to either lose weight or cross-train for another sport. This unit is very low maintenance and comes with a solid 5-year warranty on the frame and 2 years on parts. The Concept2 Model D is an ideal choice for homes, schools, gyms as well as sports training centers. It is impressive set of features, unmatched performance, and durable structure makes this rowing machine a fine choice for amateur and professional rowers alike. 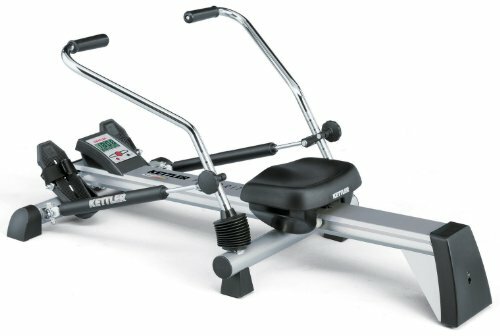 The Kettler Favorit is a mid-range budget hydraulic rower from a company that has gained a solid reputation and years of experience in the fitness world. It is a very solid rowing machine and is better suited for people looking for a short, high-intensity workout. This German made rowing machine consists of two commercial grade hydraulic pistons that provide adequate tension to each rowing arm. It offers twelve levels of resistance that can be manually adjusted. Its handles rotate outward and inward to stimulate your upper body muscles and provide a full body workout. Its high-quality pistons provide a rigorous workout for the entire body. The compact size of this machine makes it a great fit for smaller areas. This machine is very competitively priced and is one of the most budget-friendly rowers currently available on the market. This machine not only provides a great cardio workout but is also great for endurance training. Its resistance levels can be easily changed with the use of knobs located on each side of the pistons. The seat is padded and glides effortlessly along the steel track. It is equipped with sealed ball bearings, which eliminate the need for lubrication. The machine’s footplates are equipped with adjustable foot straps that offer pivoting action for smooth rowing motion. You can easily monitor your heart rate during workouts with the help of the optional Polar wireless chest strap or the infrared ear lobe clip that comes included with the machine. For a machine of its size, it is quite solid and well made. Its seats are comfortable and if you are a person of small to medium stature, you’ll find yourself very at ease on this machine. The Kettler Favorit comes equipped with the same monitor as the Kettler Kadett and features an easy to read LCD display. It displays data such as time, distance, temperature, speed, oar strokes, heart rate and calories burned. With just few pushes of a button, you can easily set a target for distance, strokes, or time and the monitor will automatically send a signal once your objective is reached. The machine comes equipped with an ear clip that can be plugged into the machine and used to monitor your heart rate. People who find the ear clip uncomfortable can always opt for the optional chest strap or wrist monitor that is sold separately. 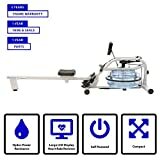 Considering the wide range of features offered by this rowing machine and its reasonable price, we can safely say that this is one the best rowing machine you can find for its price. Its compact size and advanced display are quite unusual for a machine of its category. While it is not quite a gym level piece of equipment, it is perfect for beginners who are trying to improve their rowing skills. All in all, the Kettler Favorit is a great entry-level rowing machine that is definitely worth a try. HealthCare International, a well-known name in the health and fitness world, has introduced the ProRower series of rowers to cater to rowing amateurs who want to enjoy a more realistic training experience. The ProRower H2O RX-750 Home Series Rowing Machine is a high-quality rower that allows users to enjoy the feeling of an actual boat ride from the comfort of their home. This rower is a safe and user-friendly piece of equipment and is ideal for those wanting to enjoy the health benefits of rowing without having to go to the gym. The Hydro-power drive system featured on the ProRower RX-750 is what creates the feeling of actually being on water. It employs the principle of natural water resistance to create this effect. It uses a polycarbonate water tank that contains between 2.5 to 4.5 gallons of water and an internal paddle system that moves when the user starts rowing. This system eliminates the need for mechanical adjustments. Instead, rowing speed and the level of water in the tank determines rowing intensity. As it uses actual water, strokes feel very smooth and natural. The RX-750 rowing machine comes equipped with a big-screen monitor that keeps track of workout-session details. It keeps note of session duration, distance covered in each session, speed of rowing, number of strokes completed per minute and a number of calories burnt during each workout. This really helps compare your results with previous sessions and meet your training objectives. Its also has a built-in heart-rate receiver that monitors your heartbeat. The folding design of the RX-750 home series makes this equipment a real space saver. When folded, this piece of equipment only occupies about 400 square inches. It can be shifted easily from one room to another thanks to the wheels that are attached to the frame. This machine also allows you to enjoy your favorite TV show or listen to music while enjoying a full body workout. The ProRower RX-750 comes with a tool kit that makes assembling and dissembling the unit very easy. It comes equipped with a plastic shim that you can use to align blades in the tank whenever required. The kit also includes chlorine tablets that can be used to clean the tank’s water. Built sturdily with heavy duty materials, this rowing machine will serve you for a long time. HealthCare International offers a life-time warranty on the frame, a three-year warranty on the tank and a 2-year warranty on mechanical parts and fixed components. The ProRower H2O RX-750 Home Series Rowing Machine uses advanced technology to offer some of the most realistic rowing you’ll ever experience from an indoor rower. Its ergonomic design, smooth rowing motion, and sturdy appearance really make this unit stand out from other rowers in the same category. It is an ideal investment for those wanting to improve their health and rowing skills. Its amazing set of features and advantages hugely make up for its few drawbacks. 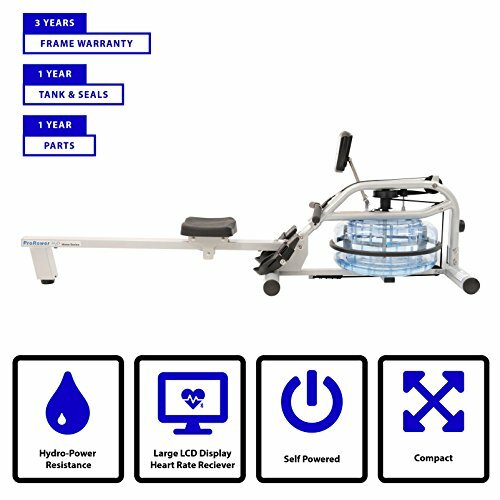 All in all, the RX-750 is a great all-in-one exercise machine and a definite must for any professional or amateur rower who wants to enjoy a nice workout from the comfort of their home. Rowing is one of the best forms of exercise one can practice. It provides a full body workout, improves stamina and helps tone major body muscles. There are different types of rowing machines that use air, water or magnets to create resistance. 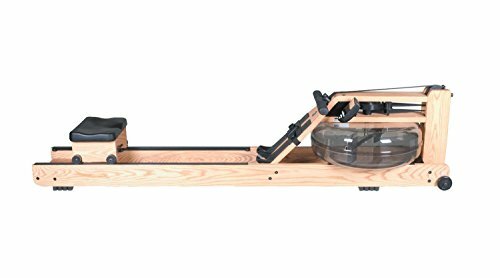 Velocity fitness has developed a comfort-oriented and motivating rower that uses magnetic resistance to provide an intense workout – The Velocity Fitness CHR-2001 Magnetic Rower. The Velocity Fitness CHR-2001 Magnetic Rower features a comfortable polyurethane-molded gliding seat, padded and comfortable-grip handles for user convenience and an adjustable footrest to fit all members of the family. This rower from Velocity Fitness employs a DMC resistance control system. This system creates resistance by altering the distance between the unit’s powerful magnet and the spinning-flywheel which is attached to the handle with a chain. So when the handle is pulled while rowing, more resistance is developed. Resistance levels can be easily adjusted through the setting options provided on the console. This Velocity Fitness programmable rower has an electrical motor that controls the tension in the cord. The intensity of the workout can be varied by changing the tension level. The computerized monitor on the Velocity Fitness Magnetic rower features an LCD display that shows session details with great clarity. It shows information such as workout duration, distance covered, the speed of workout, count of strokes completed in a minute, pulse rate and calories burnt. Velocity Fitness’s Magnetic Rower offers twelve different inbuilt programs to personalize your training. Six of these are preset and the six others can be set by the user. By changing the settings for the duration, distance to be covered and calories to be shed, users get to fully customize their workout. Some programs also offer automatic resistance adjustments to achieve the target set by the user. The Velocity Magnetic Rower can be installed easily in less than 20-30 minutes. After use, it can be easily stored by folding. Once folded, it has a dimension of 54″ x 34″ x 20″. Smaller than most air and water rowers, it was designed to fit easily in very restricted spaces. The Velocity Fitness Magnetic Rower is equipped with many features that make exercising smooth and pleasurable. After we’ve gone through the features and drawbacks of this programmable magnetic rower, we can conclude that this light and compact rower is ideal for residential use. It is a high-quality, durable and easy to use piece of equipment. Your entire family will enjoy using this rower. This piece of equipment offers incredible value for the money and comes with a solid five-year warranty. All in all, this machine is a great investment that will bring you many benefits in the long run. For many years, rowing has been considered as the best aerobic activity. This physical activity does not demand our joints to work hard, but improves our strength and level of endurance due to the smooth flow of movements involved in this activity. If you are considering it and you want a durable rowing machine which can really last the distance, don’t look further, the WaterRower Natural Rowing Machine in Ash Wood is a machine you should give close consideration. With this rowing machine, your rowing experience will leap to a higher level. This machine has a water flywheel which has two paddles in a confined tank of water. Principles governing the dynamics of boats in the water are used in this rowing machine. It offers quiet resistance, smooth paddling just like in actual rowing in the water. The WaterRower Natural Rowing Machine has been handcrafted in solid Ash wood and stained in honey oak for a beautiful finish. The advantage of this wood is that it’s ideal for absorbing the sound and vibrations made during rowing, so you get a smooth and quiet rowing experience. Also, the Ash hardwood is renowned for its immense durability so the rower will keep in tip-top condition for many years. To closely mimic the feeling of actually rowing in water, the WaterRower Natural features a cleverly designed water flywheel which has two paddles that are located in a tank of water to provide quiet resistance and a smooth rowing motion. The flywheel and water tank also have a resistance mechanism that regulates by itself, thereby eliminating the necessity of motors. As there are no moving parts in this machine, there is no worry about parts wearing out like occurs with many other rowing machines. To give you an intense cardiovascular workout, the WaterRower Natural Rowing Machine works 84% of your body’s muscle mass. This helps in strengthening and toning your muscles while you actually burn more fats and calories compared to other rowing machines of today. Your ankles, hips and knees are not tasked much by the WaterRower Natural for your body weight is not concentrated in these body parts. The Series 4 performance monitor provides various workout statistics and is user-friendly to operate. The performance monitor has 6 programming and information windows, 6 QuickSelection control buttons and 3 buttons for navigation. The lack of an automatic pause feature is a tad disappointing from a convenience perspective. The monitor also has compatibility with a heart rate chest strap and receiver, so you can take your workouts to new heights. The use of dual rails plus four wheels ensures that the seat remains stable and smooth consistently as you row so you can put all your focus into your workout and not be irritated by jerky movement. When you’re workout is finished, the WaterRower Natural can be quickly tipped upright so you can store it away without it taking up much room. Our readers who have limited space in their homes should pay attention to this aspect. Quiet and highly intense workout. The WaterRower Natural Rowing Machine is an incredible machine and does an excellent job of simulating real rowing without putting a strain on your upper body. We really like how quiet this machine is as it just makes a low sloshing sound as the water moves in the tank. This is a rower we feel is a worthwhile purchase for those who are serious about getting involved in rowing and want a very quiet machine that provides a challenging cardiovascular workout and can be relied on to last for many years. Kelly is a personal fitness trainer and nutrition expert who has worked with clients all over the world. With over 15 years in the health and fitness industry, she will be sharing her knowledge with the Fitness Fixation community and helping her family eat well, and stay healthy in the process! What Muscles Do Burpees Work? Which Muscles Do Battle Ropes Work?